This post is sponsored by Ainifeel and may contain affiliate links. Red. It’s the bold color of the 2017 winter season, and although all-black is always a foolproof winter color palette, red accessories make any monochromatic outfit pop during cold weather. 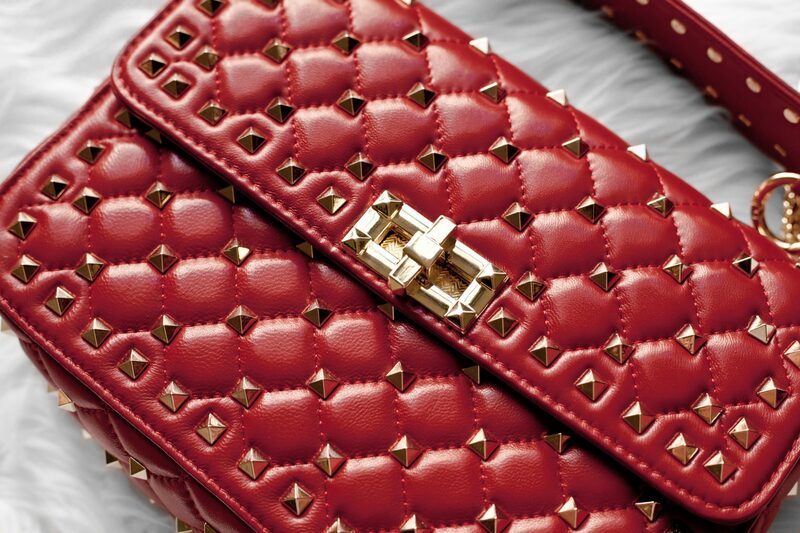 Valentino’s Rockstud Spike Quilted Top-Handle Bag has been on my list since I first saw it earlier this spring, and I knew that it would be perfect for wintertime in a bright red. 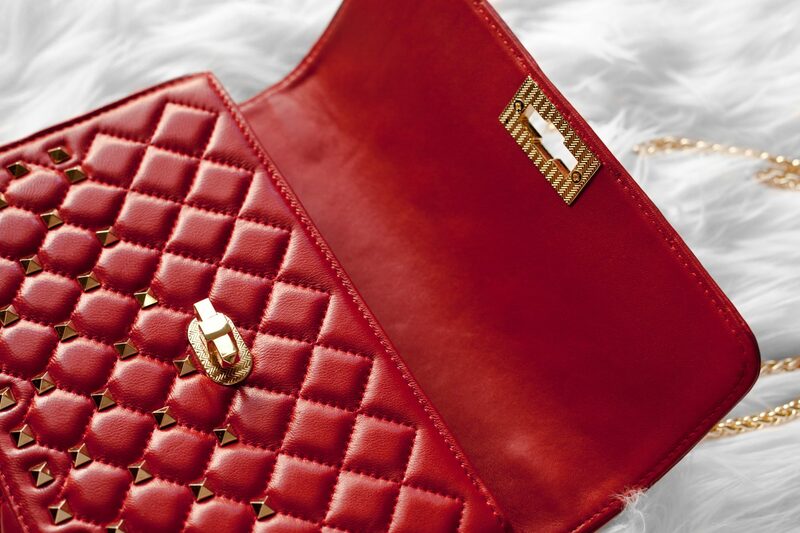 After my first experience with Ainifeel’s Chanel-inspired quilted leather shoulder handbag, I’ve been stalking the Ainifeel Amazon store practically every day to see what new quality dupes they release. 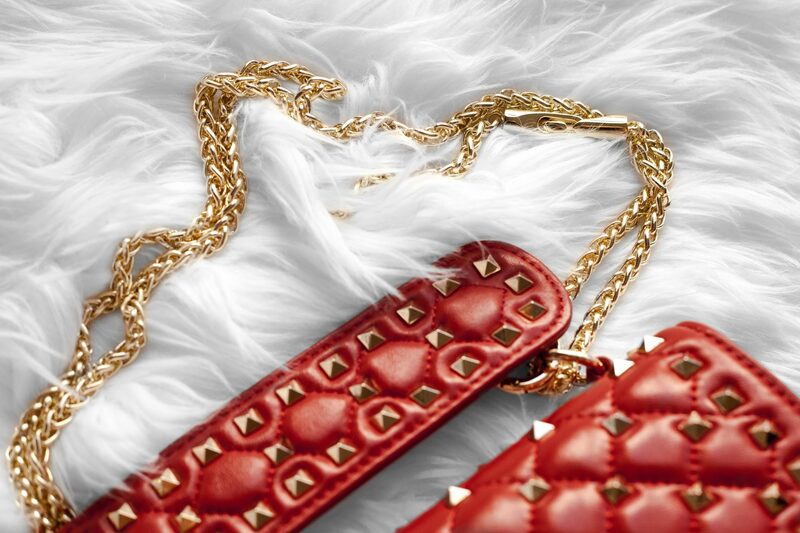 So when I saw this gorgeous handbag with the spiky pattern, gold chain hardware and buttery soft crimson sheepskin, I knew I needed to share it on the blog. 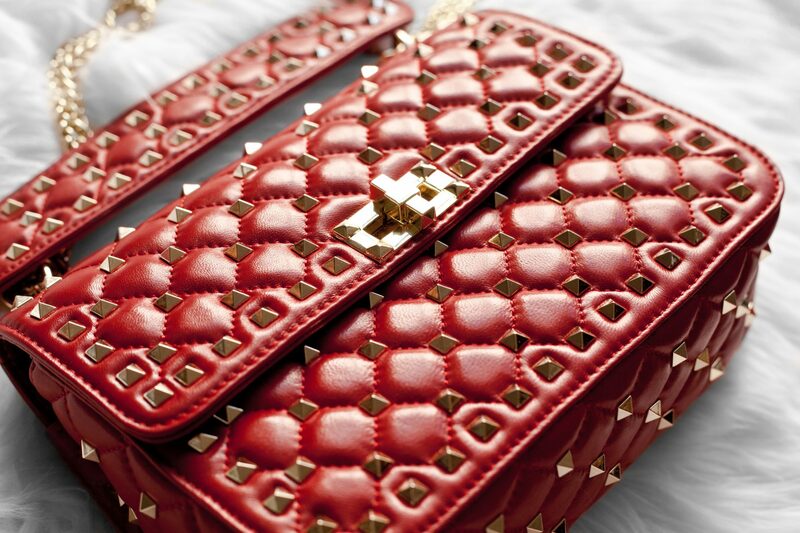 Needless to say, Ainifeel and I have teamed up again to share with you their latest release: the Valentino-inspired quilted studded top handle handbag. A brief introduction to Ainifeel: the Ainifeel Amazon store is filled with beautiful dupes of popular handbags like the Hermés Birkin, Celine Nano Luggage Tote, Chloé Pixie and much more. This particular one is from the Ainifeel Quilted and Chain Strap collection, which features several variations inspired by popular designer styles. All of Ainifeel’s products are made from genuine leather, suede, sheepskin and high-quality hardware, making these handbags a significant step above most designer dupes you will find at stores like Forever 21 or H&M. In fact, I’d like to say that their handbags are much better than even dupes that use genuine leather materials. Ainifeel just surpasses them. They have so much attention to detail and their items are just so intricately crafted for the price that you pay. I don’t think I’ve been this excited to receive a handbag in the mail before. This is my first handbag dupe made of sheepskin, and I was so interested in seeing how the quality of the material would fare. Sheepskin is so much more different compared to leather, as it’s buttery-soft like a pillow. Of course, sheepskin is much more delicate and requires a lot more tender care, so it’s important to never get it wet (that means leave it at home during rainy days) and be careful not to get it scratched. Although I have personally never owned a sheepskin bag, I do have several friends who own them and I can say that this feels just as smooth as a Chanel handbag would. This sheepskin truly is of great quality. Just look at how soft and plush that sheepskin looks. I’m always surprised when I encounter dupes with quality hardware that doesn’t feel cheap or light. 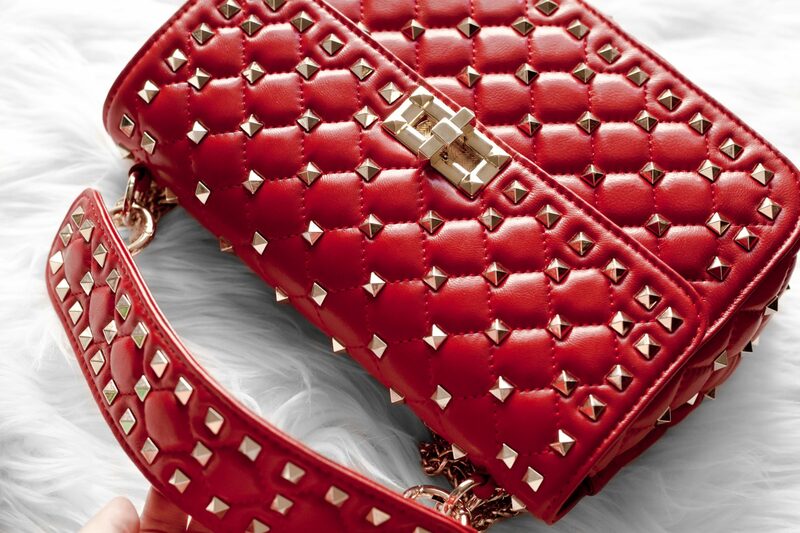 The studs all over the bag definitely feel much like the Valentino original, and the chain strap definitely has a good weight to it. The hardware is also a nice yellow gold and not a brassy orange, which is something I see with a lot of cheap-looking dupes. The only minor cosmetic flaws I saw were 2 studs that were a little bit off on the top handle, but it’s not even noticeable unless it’s pointed out (and anyway, if you hold it using the handle, no one would see it). 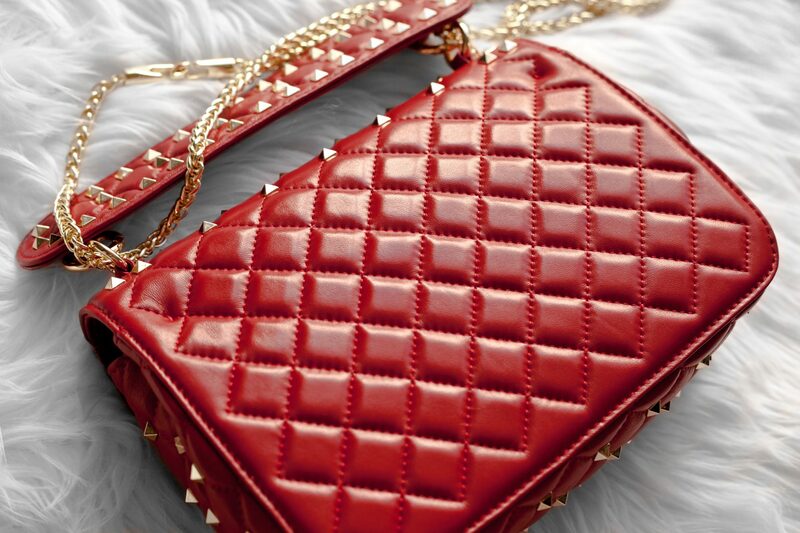 The entire body of the bag doesn’t have any misplaced or crooked studs since they’re placed on the quilted pattern. One thing to note: the chain strap the handbag comes with has two open lobster-style clasps that are not meant to be clipped into the O-rings at both ends of the top handle (if you do that, you’ll scratch up the hardware!). You simply thread the chain through the holes and clip the ends together at the top. It can easily be unhooked, but I’ve had no issues with them coming undone. This is true to the original Valentino design and definitely not a design flaw. The medium-sized Ainifeel bag measures 9” x 3” x 6.25”, which makes it still roomy for all your essentials. With a 3-inch width and single side pocket, you can place a good amount of items in the bag. The interior is lined with a simple black cloth. I prefer it this way because the exterior sheepskin is already very high-maintenance to take care of and maintain, and the interior of my bags always get dirty from my makeup (and sometimes snacks). The lock is a simple twist-lock latch that’s very similar to the Chanel Medium Flap Bag dupe I received from Ainifeel a few months ago. One issue I have with these kinds of locks is that the cheaper ones feel like they may break at any moment from too much twisting, but this one feels very secure. Overall, with the design accuracy and quality materials, I’m very surprised that this handbag is only $109. I have paid more for handbags from other brands that definitely did not surpass this gorgeous Ainifeel bag. I highly suggest getting this bag if you want to try out a sheepskin handbag without breaking the bank. I already know that if I were to spend thousands on a sheepskin bag, I would be devastated if I got it wet, stained, or scratched it up. For the price of $109, I could always buy another! 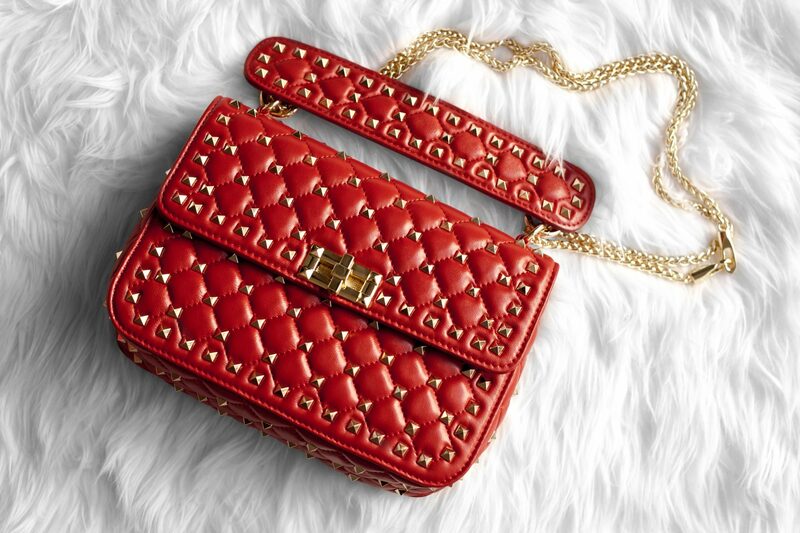 Ainifeel‘s Valentino-inspired quilted studded top handle handbag is available for $109 on Amazon in their quilted and chain strap collection. Will you be getting yourself one? Let me know in the comments below and don’t forget to subscribe to my newsletter to get more news of designer dupes delivered straight to your email. I just purchased this bag in taupe! I’m so excited!!! I have a gray Chanel double flap in lambskin that I’ve used twice in a year and a half. I’m finding that my pricey luxury items aren’t getting the use they deserve- I’m too worried about something happening to them. Designer dupes are much more enjoyable for me. I have 2 other Ainifeel bags and they completely satisfy my appetite for the designer versions. Enjoy your new bag! Ever since they released the new colors I want this bag in all of them, especially the light blue!!! could you do more designer dupe articles, please? Love your blog! Keep ballin´! Hi Misty! I try to do at least one dupe review each month, so make sure you’ve subscribed to my newsletter to get the updates!